This square looking butchers block has been made using reclaimed timber, then handwaxed and would make a great rustic feature in any kitchen. 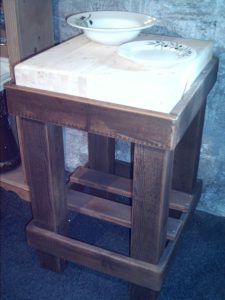 It has a large chopping block made from untreated pine, and dowel rods lay underneath this which have meat hooks to hang pans, kitchen utensils. The base is also slatted so you can pile on more pans, chopping boards and so on. height 830mm,width 650mm x 620mm.